Common research and policy issues as well as the renewal of the memorandum of understanding between the two organisations were at the heart of the President of the Korean Research Institute for Vocational Education and Training (KRIVET) Young-bum Park’s visit to Cedefop on 9 July. Both organisations do research in very similar fields and many of their researchers have exchanged visits over the years. Cedefop Acting Director Christian Lettmayr and Head of Area RPA Pascaline Descy discussed future cooperation with Mr Park. The situation in Korea is very different from that in Europe. There is low youth unemployment and great loyalty of employees to their employers, which means there is not a lot of mobility between, say, the Korean electronics giants. General education and higher education are greatly valued compared to vocational education and training (VET), as in most European countries. Nevertheless, Korea has done a lot to develop its VET system and has shown a keen interest in establishing a dual apprenticeship system. The German ‘Meister’ qualification has successfully been introduced in various VET courses in Korea. Mr Park was accompanied by Jin Park who presented KRIVET to Cedefop’s VET experts. Eleonora Schmid and Jasper van Loo from Cedefop explained to the visitors how the European policy process works and how Cedefop goes about its policy reporting tasks. Following the visit, Ms Descy received an invitation to present Cedefop at the Vocational Competencies (Skills) Development Forum hosted by KRIVET and the Korean Ministry of Employment and Labour on 23 October. While KRIVET is active in the field of research, the Human Resources Development Service of Korea (HRDKorea) implements VET policies. 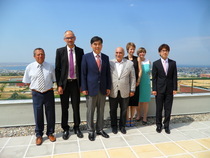 HRDKorea Deputy Director JeongJae Seo visited Cedefop on 8 August. Head of Area Communication, Information and Dissemination Gerd Oskar Bausewein presented the work of Cedefop, Head of Library and Documentation Marc Willem demonstrated the various functions of the centre’s online information services and Senior Expert Slava Pevec Grm gave a detailed introduction to the way the European Qualifications Framework (EQF) works.